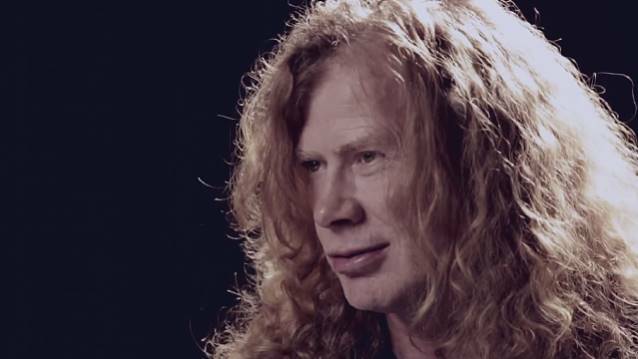 The Hague Tribunal announced today that it has arrested and indicted Megadeth frontman Dave Mustaine for crimes against metal. The famous international court, headquartered in the Nethelands, oversees the prosecution of war criminals and political leaders who violate human rights and the Geneva Convention. This event marks the first time a musician has ever been put on trial. 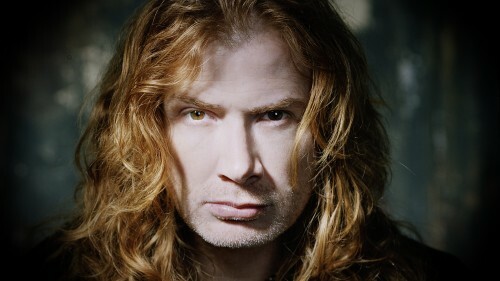 The charges against Mustaine are numerous, including multiple allegations of ousting bands from tours and festivals due to their Satanic content, evidence of condemning substance abuse while abusing substances, ten counts of releasing awful albums, becoming a born-again Christian, and an additional charge of willfully refusing to spell his band name correctly. Perhaps the most grievous accusation leveled against the guitarist is his inability to move past his dismissal from Metallica, an event that occurred over 30 years ago. 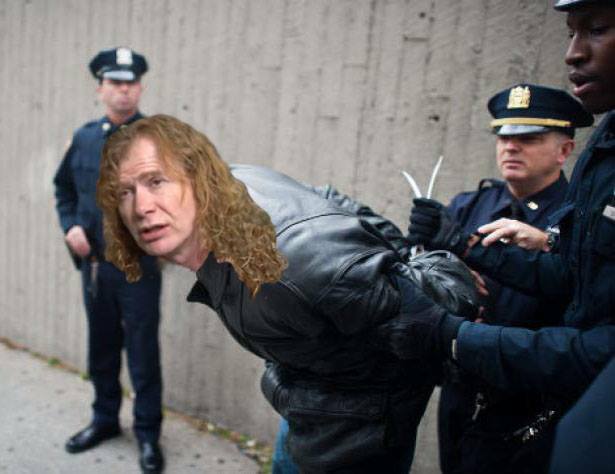 Currently, Mr. Mustaine’s legal team is working to have him temporarily released so that he may continue touring in support of his latest atrocity, Super Collider. The trial will commence in May, and Lars Ulrich is expected to be the prosecution’s star witness. Often at this website, we are accused of fabricating stories or writing “joke news” articles. While we consider this sort of attack on our jurnalizmcore integrity to be unfounded and patently absurd, we are willing to admit that there is a good deal of fake news out there parading as truth. Tyranny of Tradition’s staff of over 500 reporters, 700 editors and 3,000 fact checkers constantly strive to tell the truth, the whole truth and nothing but the truth. The same cannot be said for many of the best-known acts in heavy metal. The truth is that many of the most memorable stories in metal history are just that, stories. Nothing more than creations of either the artist or the record label in order to drum up attention for the band. Here are a few of the most famous myths in heavy metal history unmasked once and for all. For a myth to be effective, it often has to have a shred of truth in it. While it is true that Dio first used and popularized the symbol, it was not invented as the shout out to Satan that most people think. While Dio was touring with the band Elf in 1972, the band visited Canberra, Australia. While there, he was performing in front of a crowd filled with mostly deaf aborigines. During the first song, many in the crowd realized that Dio’s fly was unzipped. The symbol in Aboriginal Sign Language for “your fly is down” is the horns hand gesture. 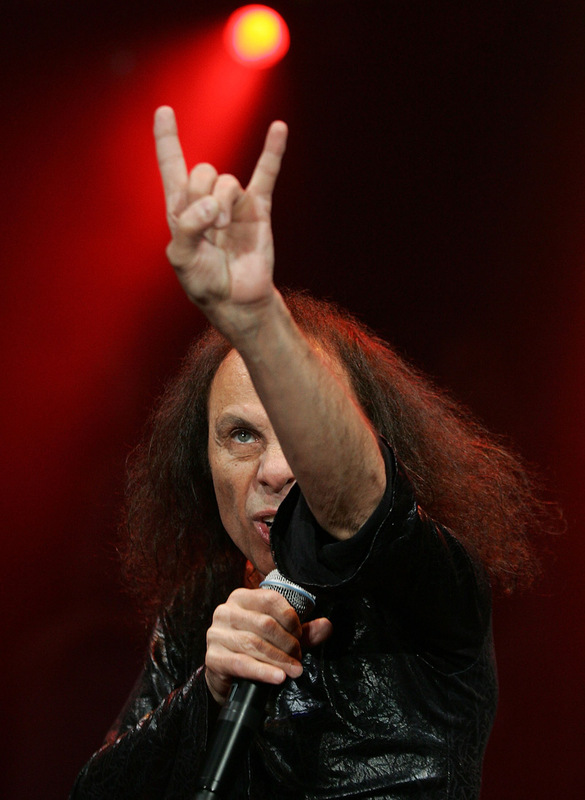 Hundreds of people began flashing the sign to Dio, who, thinking it was a spontaneous show of enthusiasm for his music, began flashing it back. Finally, he realized why they were doing it and took care of the embarrassing situation. However, he was so impressed by the sea of horns up hand signs, he began incorporating it into his stage act. Satan had nothing to do with it. We are often astonished at how many people in our culture are members of this religious movement. From Prince to Venus and Serena Williams to Abbath, there are many recognizable cultural icons that you wouldn’t think are Jehovah’s Witnesses but are. Some, like Abbath, even still go door to door preaching The Word. Mike Muir, however, is not one. An article appeared 3 years ago in USA Today about the religions history in which Muir was described as an active member of the faith. The reporter confused Mike Muir from Suicidal Tendencies with Mike Muir, a carpenter from San Luis Obispo, California. Don’t expect Cyco Miko to come a’knocking at your door anytime soon. In many ways, this is truly The Great Rock’N’Roll Swindle. It started as a joke between friends Lars Ulrich and Dave Mustaine. The two concocted a pretend feud centered on a made up story about Mustaine being kicked out of Metallica. This was completely untrue. Over the years, the joke has gotten somewhat out of control with Mustaine going so far as to put a song exactly like a Metallica song on a Megadeth album (Mechanix, a direct copy of The Four Horseman) and several doctored photos and videos of Mustaine with Metallica floating around on the internet. Things really reached a ridiculous level in 2004 when Ulrich and Mustaine created the hysterical “little Danish friend” scene in the Spinal Tap sequel known as “Some Kind of Monster”. This is yet another in a series of examples of how, as Mark Twain once said, “A heavy metal lie can go halfway around the world before the truth can put on it’s combat boots”. Scott Baio, known for his work on sitcoms “Happy Days” and “Charles In Charge”, was linked to the band on several websites earlier this year including a Facebook site called “I Bet I Can Get A Million Lithuanians To Tell Kerry King To Let Scott Baio Back In Slayer.” The rumor, as strange as it sounds, wasn’t all that far from the truth. Baio is, in fact, a die-hard metal head and played drums briefly in the 80s thrash band Forbidden, but was never in Slayer. This ridiculous, unfounded rumor was circulated around the Internet by some 3rd rate metal Onion site. Why an Onion would be made out of metal is beside the point. Typically, Mother Nature is capable of producing both metals and vegetables, but rarely has she seen fit to create a hybrid of the two. And what would be the point of such a vegetable? Anyway, this rumor got so out of control that the Royal Family was forced to issue denials and actually barred the writer from ever visiting England. But, he was not planning on going there anyway, because he had heard that British people eat fish and chips off of newspaper. Which is disgusting. 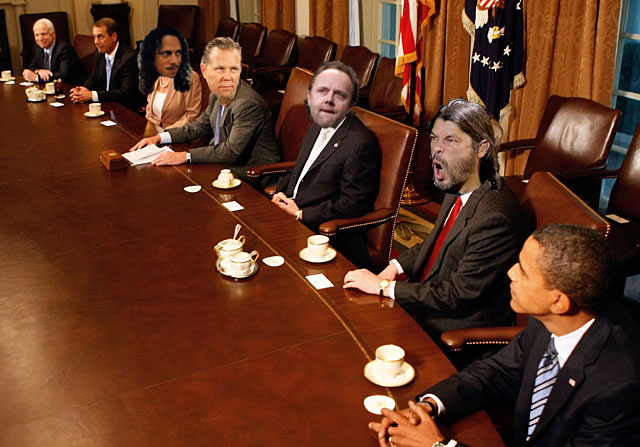 We all know about the Super Collider debacle: with the collapse of their latest dud product, the executives of Megadeth have been circling the drain for months. Rumors of a top-line overhaul have leaked out of boardroom minutes, but it seemed as though the crisis was contained, at least, to the 42nd-floor offices of the company’s CEO, CFO, and CDO. Of course, Megadeth has been bleeding capital since at least 2004, but now it looks as though Wall Street is looking to turn the fallen eagle into a veritable vulture’s picnic. Here’s how the story began: Metallica, one of the largest investment banks on Wall Street and former owners of Megadeth, gradually began buying back Megadeth stock earlier this summer. The bank announced in early July that they would be purchasing up to 20 million Megadeth shares at prices between $52 and $58 a share, supervised by Iva Harrison’s firm, Lazard Freres. In August, they bought even more – 21 million shares – at $53.50 each. 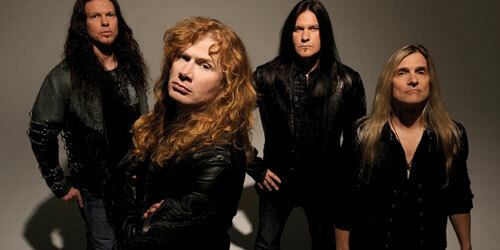 Megadeth, which had traded around $52 a share in anticipation of the buyback, immediately fell back into the mid-forties. Metallica had spent more than $1.1 billion buying Megadeth stock, and its price was lower than ever. Private equity analysts began sweating about what this spelled for Megadeth’s future. Another, “Special Report On Megadeth Research & Development” stresses the need to cut back on Megadeth staffing, by “eliminating unnecessary employees,” in order to concentrate capital on R&D projects. KKR defeated Dillinger and Metallica back in 1989 to complete the leveraged buyout of RJR Nabisco, which at the time was the largest buyout in history. Subsequent layoffs, downsizing, and restructuring spelled doom for RJR Reynolds and Nabisco employees across the country, as well as the ruin of towns like Winston-Salem. In that sinking ship of a business deal, the executives, financiers, and lawyers floated to safety on golden-parachute life rafts, taking home millions in bonuses while thousands of employees of both companies lost their jobs. We have always been a Bolt Thrower family. Many of our happiest, most memorable times have been spent listening to their music. 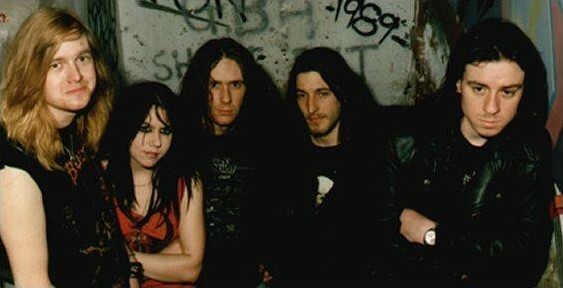 Whether it was me soothing my son on his first trip to the dentist by playing him all of “In Battle There Is No Law” or my wife and I making the long car trips from Atlanta to Minnesota go by quicker by singing “Cenotaph” with them, Bolt Thrower have almost been like relatives. This is why, on my daughter Jo-Anne Bench Spillett’s sixth birthday, we’d like to hire Bolt Thrower to play the party. However, as you probably have figured out, hiring a death metal band to fly from England to Atlanta to play can be expensive. My wife and I talked about how to make it happen financially, but short of working nine more jobs and selling the platinum grill I had made during my brief rap career, it didn’t seem affordable. Enter the miracle that is Kickstarter! We have seen several projects from a Veronica Mars movie to an Obituary album to a nose job for Sebastian Bach all get funded this way. Why couldn’t our dreams come true as well? Therefore, I am proud to announce that The Tyranny of Tradition will be starting its first Kickstarter campaign to raise $250,000 dollars to get Bolt Thrower to play my daughter’s 6th birthday party on November 22nd. Sure, $250,000 is a lot of money, but I want to assure each and every one of you that each and every penny will be put to good use. In the spirit of transparency, here is an itemized list of what the money will be used for. Bolt Thrower is a legendary band and they won’t come cheap. Being metal legends, they deserve to be well compensated for their time. They will, of course, be responsible for their own airfare. While we’d love to have them in our home for a one-time, special birthday concert, the wife and I are not particularly keen on letting them stay in our house overnight. We live in a gated community with an extremely active homeowners association. I’m not sure they would be willing to tolerate Baz Thomson walking out at 7 o’clock in the morning holding a Miller Lite and wearing nothing but his boxer shorts to get the newspaper. Let’s face it, they are kind of, well, dirty looking. Not any more than most metal bands, but certainly not the type of people we necessarily want the neighbors to see us with. They’ll fit in fine at the Super 8 motel out in Snellville. According to the City of Atlanta, I’m not technically allowed to have a death metal band play in my backyard without a permit. Because of the potential noise and disruption, several local city officials have told me that it will be impossible to get a permit for the event. The $20,000 will be used to bribe the necessary City Council Members needed to get us the permit or, in case they are unwilling to be bribed, to hire a private investigator to dig up humiliating blackmail information on them. Instead of hiring one of those costly, pretentious professional security companies, I have contacted a local motorcycle gang, known as The Disciples of Satan, to make sure that things don’t get out of control. Not only will they be tasked with crowd control, they will need to go door to door in the days leading up to the concert and threaten my neighbors with violence or the potential kidnapping of their children should they complain to the police about the noise or lack of available parking. The Rolling Stones used a similar approach to security with great success. Our home is simply not ready for a concert of this magnitude. The backyard will need to be equipped with arena style seating, a stage and adequate bathroom facilities for the 10 or 20 children that will be attending. Also, a hot tub will need to be added overlooking the backyard in order to allow me to help loosen up my back from moving furniture to ensure the children don’t break anything if they wander into the living room. We will also need to add marble countertops in the kitchen and a new family room in order for us to spend quality time together. Bolt Thrower is an older band who probably can only do a one hour set without risking collapse. Most parents expect these parties to go 2 to 3 hours. So, the show will feature several talented local bands including Spectrecide, Butter Knife Appendectomy, and Dysrythmic Sphincter Valve who will perform while the kids are playing party games like Pin the Murder Rap on Randy Blythe. Besides old school death metal, both of my young children love Pokémon. What would make them happier than if people dressed in Pokémon suits came out during Bolt Thrower’s set to really get the pit moving? We’d have Snorelax, Charazard and even, during the encore, a visit from the one and only Pikachu. It’s amazing how many things need to be rented or purchased outright in order to make something like this work. Lights, speakers, smoke machines, animal parts to be tossed into the crowd, a cake, and goodie bags filled with Bolt Thrower merchandise can really add up. This is America. No one works for free. My wife and I plan on working hard to make this day very special for our little girl. Thusly, our effort should be rewarded in the form of monetary compensation for our time and labor. Hopefully, this campaign will raise the funding necessary to make my daughter’s birthday a day to remember. If it is successful, this is only the beginning. 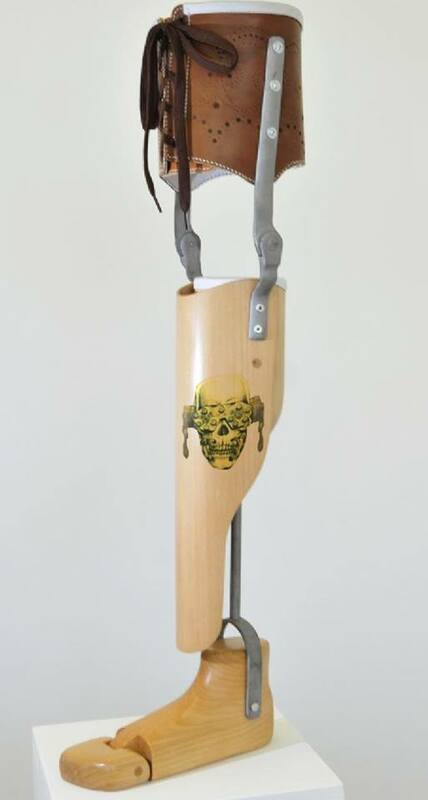 I am already in the planning stages of several possible Kickstarter campaigns including a $300,000 campaign to stop Megadeth from making another album, a $5 million dollar drive reanimate Dio and a $250 million dollar fundraiser to take over the nation of Botswana and declare it a Heavy Metal Republic. So, take a moment of your time and help us to make November 22 the best 6-year-old birthday party ever. You’ll be glad you did.